The ‘Profit and Loss’ report in Numerable matches the ‘old’ P&L report in Xero (the one not labelled as ‘NEW’!). 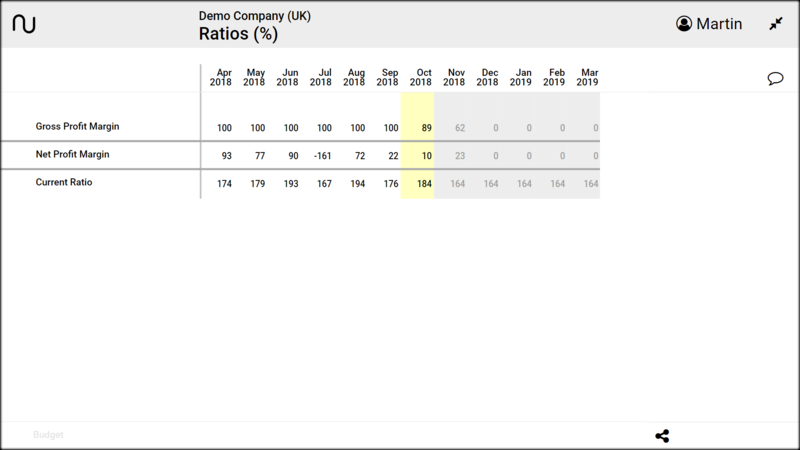 If the Xero user has created a custom layout and set it as the default for P&L, then this report uses the custom layout. 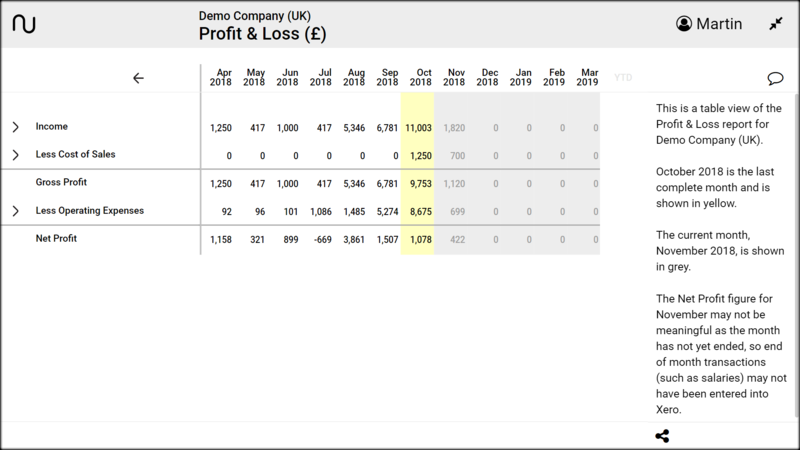 If Xero’s default layout is the standard layout then Numerable’s Profit and Loss report also uses that layout. This report does not currently have budget figures available. 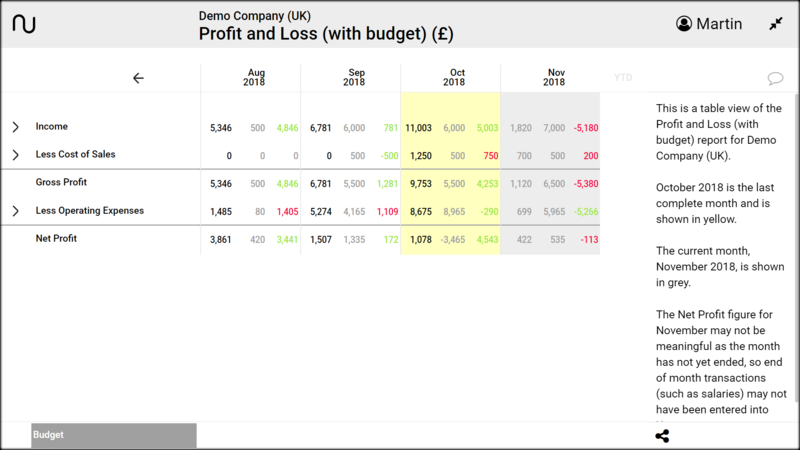 The ‘Profit and Loss (with budget)’ report in Numerable uses a fixed layout that matches the standard Profit and Loss (old) layout for the country set for the organisation in Xero. Budget figures are available – click on the Budget button in the lower left corner to see them. The budget values are imported from Xero’s Budget Manager. The ‘Balance Sheet’ report in Numerable matches the ‘old’ Balance Sheet report in Xero (the one not labelled in Xero as ‘NEW’!). 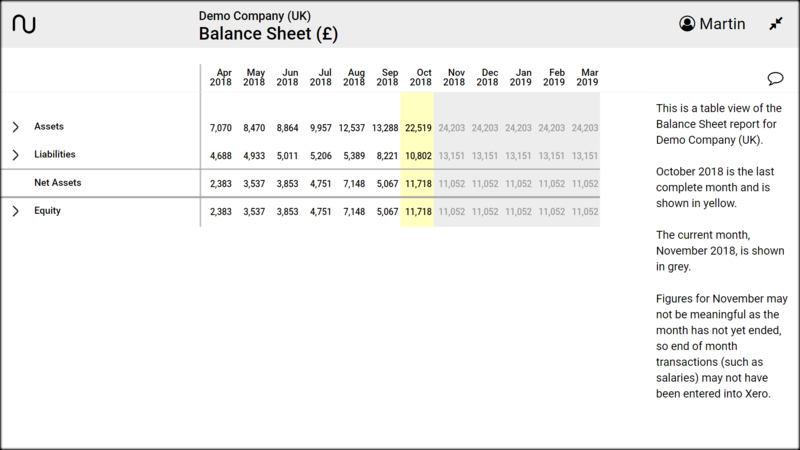 If Xero’s default layout is the standard layout then Numerable’s Balance Sheet report also uses that layout. 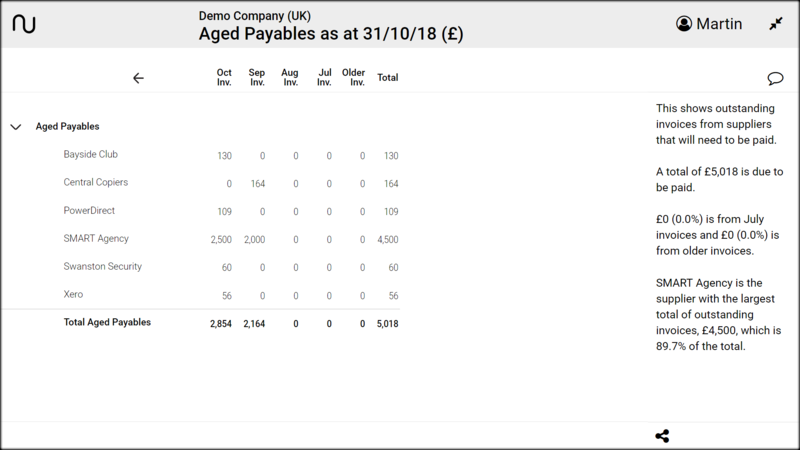 If the Xero user has created a custom layout and set it as the default for Balance Sheet, then this Numerable’s Balance Sheet report also uses the custom layout. This report shows the amounts outstanding to suppliers, in a form similar to that of the Xero Aged Payables report. The amounts outstanding are shown in columns corresponding to the dates of the invoices. The 8 suppliers with the largest total outstanding balances are shown in the top part of the report, and the rest are shown in the Others section. 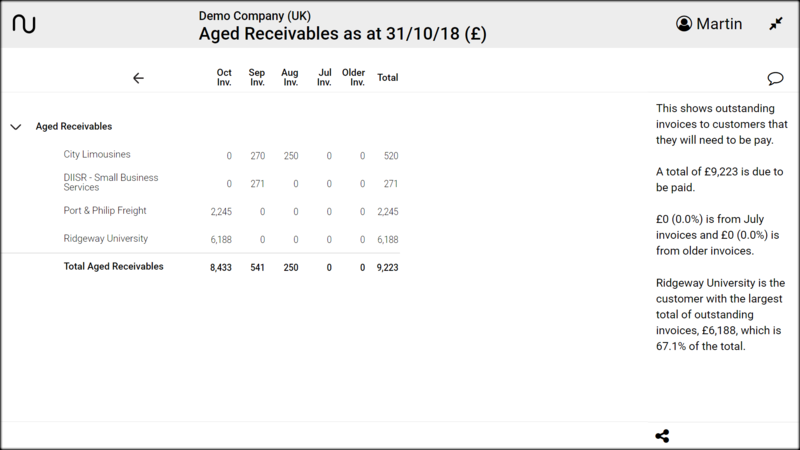 This report shows the amounts outstanding from customers, in a form similar to that of the Xero Aged Receivables report. The 8 customers with the largest total outstanding balances are shown in the top part of the report, and the rest are shown in the Others section. 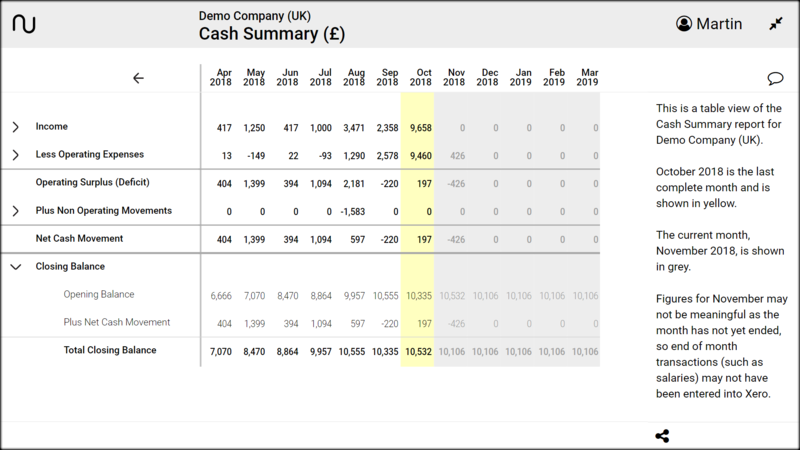 This report shows cash flow in a form similar to that of the Xero Cash Summary report. However the grouping of cash transactions into sections may differ from that in Xero. The bottom row in the Numerable Cash Summary shows the Closing Balance, which can be expanded to show how it results from the Opening Balance plus the Net Cash Movement. Accounting ratios are useful indicators of financial performance or status. They are calculated by dividing one amount in a financial statement by another. Numerable’s Ratios report currently shows the Gross Profit Margin, Net Profit Margin, and Current Ratio, all as percentage values. More ratios will be added in the future.